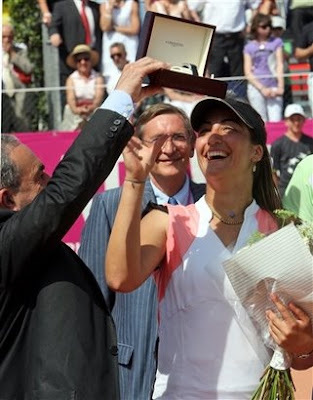 Aravane Rezai won her first WTA title when she beat Lucie Hradecka 7-6, 6-1 in the Strasbourg International final. Alexandra Dulgheru, a Romanian qualifier ranked no. 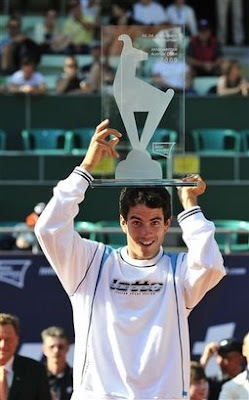 201, won the Warsaw Open (gulp!) in her WTA Tour debut by beating Alona Bondarenko 7-6 (3), 3-6, 6-0. Lucky girl! Guillermo Garcia-Lopez won his first ATP Tour title, rallying past Julien Benneteau 3-6, 7-6 (1), 6-3 in the Austrian Open final. 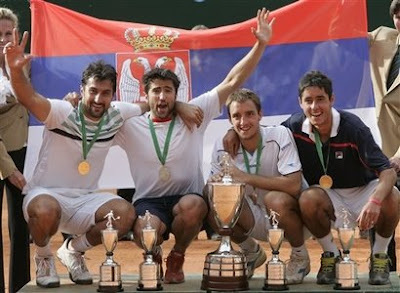 Serbia defeated Germany to win the World Team Cup, becoming only the second team in the tournament’s 32-year history to lift the trophy on its debut. Viktor Troicki claimed a 6-4, 7-6 (5) win over Rainer Schuettler and Janko Tipsarevic sealed the victory by beating Philipp Kohlschreiber 6-2, 6-4. Nicolas Kiefer and Mischa Zverev took a point for Germany, beating Troicki and Nenad Zimonjic 7-5 4-6 10-7. 2009 French Open Day 2: What else but Pink?